Every person should have a well-functioning and beautiful smile, but empty spaces due to missing teeth may keep a person from achieving any of those qualities. At Anaheim Hills Smile Studio, we offer patients dental implants, to comprehensively restore a lost tooth to a full arch. This tooth replacement option is known for its stability and aesthetic. Dr. Adelynia listens attentively to meet patient expectations and goals by providing high-quality dental care. Implant-supported restorations are one of the best methods of replacing a lost tooth. They are surgically placed into the jawbone to provide sufficient support to the prosthetic of your choice. By placing them into the bone, it halts and reverses resorption, to give patients healthy jaw density. 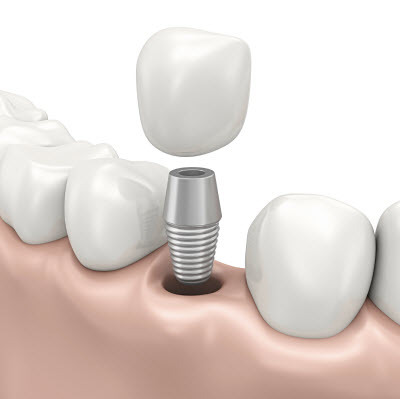 A dental implant is typically made up of three components, the post, abutment, and the restoration. The post is the section of the implant which is inserted into the bone, while the abutment is used to attach the tooth replacement to it. Finally, there is the prosthetic, which is the visible portion of implant treatment to provide patients a beautiful smile. • A patient does not or cannot wear a traditional appliance such as dentures or bridges. • To encourage healthy jawbone growth. • Keep surrounding teeth from shifting into the empty spaces of your smile. Obtaining implants allow patients to prevent future complications from missing roots of teeth. Having the bottom section of the tooth stimulates the preservation of current, healthy bone mass. When you come into our Anaheim Hills practice, we ensure your comfort by providing you with thorough information regarding your treatment. For implant placement, you do not have to worry about going to an outside facility, as we have a periodontist come in to insert them in-house to give patients convenient care. You may receive as many dental implants needed to reach your goals. Once you have the appropriate amount of healing time, we place your restorations. Your implants are adaptable to a range of prosthetics, so you can replace a single tooth all the way up to a full arch. If you would like more information regarding dental implants, contact Anaheim Hills Smile Studio to schedule a consultation with Dr. Adelynia. Our dental team expresses joy when a patient leaves our practice with a natural-looking, attractive smile.